The World of the New Testament has proven to be an outstanding resource for study of the historical and cultural background of the New Testament. There are essays on every imaginable subject, from monotheism to the social status of women and children to Jewish dietary laws to zealots to weights and measurements to exile to slavery to geographical and archaeological studies of the New Testament lands, all with extensive bibliographies for those wishing to pursue more specialized studies. Highly recommended for those looking to get a good ‘lay of the land’ perspective on the New Testament from a historical, cultural and social standpoint. Later Medieval Metaphysics is a collection of specialized and generally technical essays around the subjects of language, ontology and language. Topics include Duns Scotus on the subject matter of metaphysics, Buridan and Aquinas on the existence/essence distinction, Avicenna on types and tokens and the power of medieval logic. These are, as noted above, technical essays – this is clearly not an introductory volume as it assumes at the minimum a working knowledge of the three main subjects. The discussions on essence/existence and logic are especially technical and quite dense. Despite its advanced reading level, the essays are well-written and are a good place for the student of medieval philosophy to really get deeper into the subject. Theology’s Epistemological Dilemma is a book that I was very excited about – I had it pre-ordered several months in advance and it has not disappointed. The basic idea that the author, Kevin Diller, has is to tie Karl Barth and Alvin Plantinga together into one unified epistemological front, and it’s quite interesting to watch this project unfold. This book could serve as a good introductory text to the thought of both Barth and Plantinga – there’s no new ground broken here, as Diller simply sets out the overall ideas that Barth/Plantinga are known for. Properly basic beliefs, warrant, Barth’s theology of revelation, foundationalism and much more are laid out thoroughly (though not in an overly technical manner) and then synthesized – and that’s where the new ground is broken. Highly, highly recommended for anyone interested in philosophy of religion and religious epistemology. How God Became Jesus is a multi-author reply to Bart Ehrman’s latest book ‘How Jesus Became God’. I haven’t read all of Erhman’s book, but as a state-of-the-field report of early christology, and early Christian devotion to Jesus, ‘How God Became Jesus’ has been a solid read. Essays from Michael Bird, Chris Tilling, Simon Gathercole, Craig Evans and Charles Hill cover various aspects of Erhman’s claims, ranging from Jesus’ self-understanding, how the early Christians thought of Jesus, and Paul’s divine christology, which is Chris Tilling’s field of study (and on which he has recently published a very well-received book). Interactions with classic and contemporary work in the field (ranging from Hengel, Hurtado, Bauckham and others) make this an excellent guide for those looking to learn more about earl Christology. Dominus Mortis is another book I was very excited about receiving – it’s actually become one of my favourite specialized studies. Medieval christology, theological metaphysics, modern theology, Luther and his theology and more are all discussed clearly, and though this is a specialized study it’s not so technical as to be inaccessible. In fact, given the dense subject matter (the hypostatic union, the impassibility of God, etc), I was pleasantly surprised by just how easy it was to read. What I absolutely love about this volume, though, is the brief summary and conclusions at the end of each chapter – the argumentation can often be dense and it’s very helpful to have a recap at the conclusion of every chapter. The overall thesis of the book, that Luther was not a passibilist in his doctrine of God, is a very provocative idea that one doesn’t hear often, and the exegetical and theological arguments deployed are quite interesting. This is definitely an essential book for Luther studies and for anyone who wants to learn more about theological metaphysics, medieval christology ( I learned a completely new concept, that of ‘suppositional carrying) and Luther’s doctrine of God. Jesus is Lord, Caeser is Not is another multi-author volume, this time on the topic of the anti-imperial rhetoric in the New Testament. This particular volume serves as an excellent introduction (though critical) to the field, with two essays focusing on the development of the anti-imperial trend in NT scholarship and the rest of the essays critiquing specific theses. Topics range from anti-imperial themes in Romans, Acts, John, and Phillipians, the emperor-cult of Rome, the place of the state in relation to the church. This book is a good overview of anti-imperial studies in the New Testament that covers a large amount of ground with plenty of bibliography for those interested in further study in just how subversive the New Testament really is in terms of power and politics. Mind, Matter and Nature: A Thomistic Proposal for the Philosophy of Mind has a number of strengths. It’s a comprehensive survey of contemporary philosophy of mind, laying out, interacting with and critiquing all the major positions (matieralism, eliminativism, functionalism, dualism, emergentism, etc) in a very fair and even-handed way. While it presents the viewpoints fairly and thoroughly, it’s not especially technical and could function as an introduction to the field (indeed, the author states that the book assumes no prior knowledge of philosophy of mind). Following the interactions with the contemporary positions is a very good exposition of Aristotliean philosophy of nature, getting into things like form, matter, change, and hylomoprhic dualism. Following this exposition is the real purpose of the book, which is a Thomistic philosophy of mind, taking an Aristotliean line on subjects like sensation, form, intellect, mental states and the soul. Overall, this is a well-argued and even-handed contribution to philosophy of mind. A New Heaven and a New Earth is one of the very few books on eschatology I’ve read (and I haven’t completely finished it yet), and it follows more or less themes that have become popular through the work of N.T. Wright in ‘Surprised by Hope’ – vocation, the goodness of creation, the vocation of man as an image-bearer, how man builds for the Kingdom, etc. What I’ve enjoyed so far, apart from the ‘damn greek philosophy’ charge in the first section of the book, is how the topics like judgement and power aren’t sugar-coated. Judgement here is seen as something from God that will destroy the wicked for the benefit of the righteous, and power is seen as a natural kind of thing and not itself inherently an evil. The chapters on man’s vocation do a bang-up job of laying out things like temple imagery and man’s vocation as reflecting God’s glory into creation – so far, this is a great book, full of sound exegesis and biblical exposition as well as a good amount of interaction with non-biblical material (especially concerning judgement) and other scholars in the field. I also got a selection of readings of Aquinas, which is already proven very helpful. 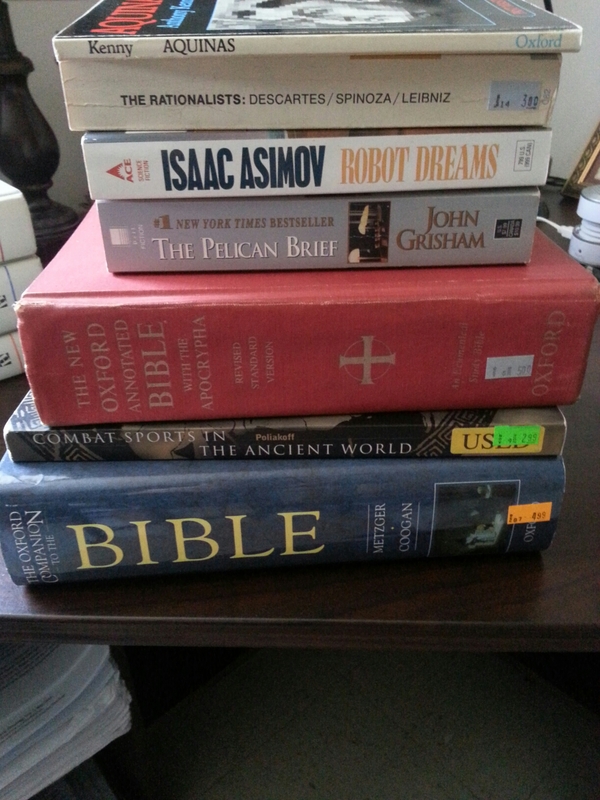 All the big topics are covered – the soul, being and essence, principles of nature, ethics, proofs of God – and it’s handy to have all this in one good-sized paperback for quick reference (I’m a big believer in references books, in case you didn’t know). Aquinas’ style is fairly easy to read though the subject matter can be a bit dense. His writing and argumentation definitely improves the older he gets though – his first works are pretty wham-bam, but by the time we get to the Summa, it’s a very patient, almost relaxed style. ‘Theology’s Epistemological Dilemma‘, by Kevin Diller, is a fantastic book. That’s the first thing that should be said about it.The second thing that should be said is that it is, given the subject-matter, remarkably clear. The third thing that should be said about it is that it is a genuinely interesting book. The overall goal is to synthesize Barth and Plantinga into one unified epistemic response to modern epistemic challenges, eg warrant, justification, basically the things Plantinga is famous for. The dilemma here is reconciling a ‘high view’ of theological knowledge – we can know things about God, know God exists – with a low view of human capacity for such knowledge – taking into account the ‘noetic effects of sin’ and drawing the conclusion that warrant does not come from us, from below, but from above, from God. Basically, it’s theo-foundationalism – God is the foundation for theological knowledge, as per both Barth and Plantinga. God makes Himself known, we do not arrive at God via reason. Overall, this book is just a fantastic work of scholarship. Close attention is payed to primary texts (both in Plantinga and Barth) and the ideas of both men are discussed in a very clear way – I’d actually say this is about as accessible as you could make the thought of Barth and Plantinga without dumbing it down any. Warrant, revelation, justification, natural theology – all stuff you read Barth and Plantinga for, basically – is layed out, discussed and synthesized. I’ll have lots more to say on this work and the arguments within it later – but for now, I’d definitely say this is a must-read for anyone interested in Barth, Plantinga, philosophy of religion, epistemology, and philosophy in general from a Christian perspective. 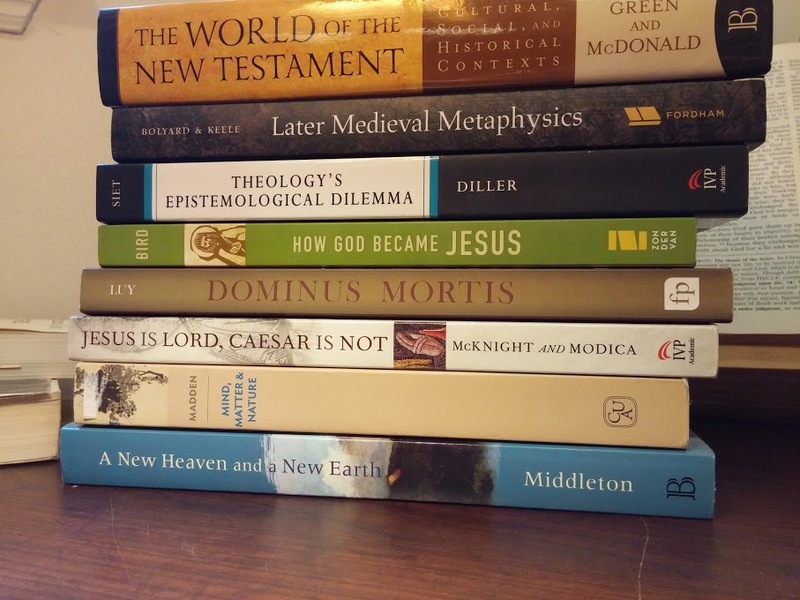 I just recently got ‘Jesus is Lord, Caesar is Not‘, and am about 80% of the way through. The primary goal of the book is to basically say, ‘whoa, slow down there, sonny’, to the anti-imperial/postcolonial readings of the New Testament, especially Paul’s letters. I’ve read it quickly, so I’m sure I’ll come back to it for further reference, but so far the standout sections deal with Luke, Acts and Romans – the anti-imperial/postcolonial readings of these texts are taken to task for a few different things, such as the use of very modern methods in reading ancient texts, importing modern concerns to ancient texts, poor handling, both historical and exegetical, etc. Not to say that such readings are condemned – the anti-imperial character of New Testament writing is something that’s proven to be a pretty important aspect of the New Testament, and for bringing that out we should be thankful to those who advocate such readings. When the meaning of the NT is reduced to anti-imperial rhetoric, however, then there’s a problem. I also got Peter Leithart’s ‘A House for My Name‘, and started reading it (I’m only a few pages into it so far). Good so far – lots of tying together the symbolism that saturates the Old Testament – specifically the three-layer cosmology of Genesis. Good stuff. Today I bought three more John Grisham books – ‘The Partner’, ‘The Chamber’, and one other I forget the name of. I also got a Father Brown story by Chesterton. On that same note, I read more of Brian Greene’s ‘The Elegant Universe’, as well as renting the NOVA documentary of the same name. The experimental aspect is definitely where string theory lacking – but empirical testing would require a particle accelerator roughly the size of the milky way galaxy. But the math more than hold true, it basically units quantum mechanics and relativity theory in a way that was impossible before. Most physicists will tell you that the experimental data is the most important part of a thrust, however, and there won’t be any for string theory for a while if ever. Continuing that same note, I picked up Timothy Ferris’ absolutely brilliant book, ‘Coming of Age in the Milky Way‘, which remains one of my favourite science books I’ve ever read. As far as history of science goes, this is probably as good as it gets – I’ve yet to read a volume which explains and expounds the ideas as well as the thinkers behind them so clearly and delightfully. Yes, reading about Kepler’s calculations for elliptical planetary orbits, Newtons theory of gravity, the quantum revolution and particle physics can, in fact, be great fun. John Grisham’s ‘The Summons’ has been a great read – fun, mysterious, page-turning, etc. It’s the first of his I’ve ever read, and I can see now why he’s pretty much at the top of the modern canon of fiction. I actually don’t know the last time I read a book that kept me up late to read it. .Brian Greene’s explanation of string theory and its unification of both general relativity and quantum mechanics in ‘The Elegant Universe’ is so far some of the best writing on the subject I’ve been able to find. A short segment on the nature of physical laws caused me to break out Feynman’s ‘Six Not-So-Easy Pieces’ where he talks about the symmetry of physical laws. The nature of physical law is a fascinating thing to reflect on – especially the ontological status of said laws. Torrance’s essay on Polanyi in ‘Transformation and Convergance in the Frame of Knowledge’ is a brilliant essay – his exposition of some fairly complex ideas is outstanding. The whole book is great, but the Polanyi essay is probably one of the stronger essays in the book. Torrance’s concept of stratified levels of intelligibility in reality is definitely something I’ll be thinking further on.